The sundrenched Hawaiian archipelago is made of up of eight major islands surrounded by numerous atolls, bays, and inlets in the heart of the Pacific Ocean. The majority of visitors are drawn to the islands by the promise of long sunny days on the beach and countless hours of water sports in the warm tropical waters, but the six major tourist islands of Hawaii have even more to offer visitors. 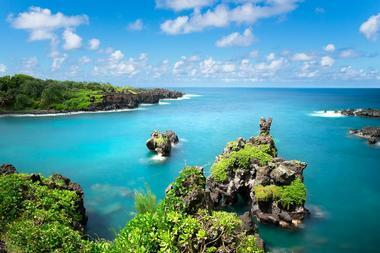 Here are the best places to visit in Hawaii. The fun never stops on Maui and you will find yourself longing for more hours in the day to explore the myriad of attractions on offer here. The island is blessed with more than 30 wonderful beaches where you can relax, swim, snorkel, scuba, and paddle. You can watch big-wave surfing competitions or get out there and catch a wave yourself – lessons and equipment are widely available. You can explore the island’s heritage along the Lahaina Historic Trail, hike through the lush and beautiful Iao Valley State Park to see where historic battles took place, or watch the daily sunset cliff-diving ceremony at Kaanapali Beach. 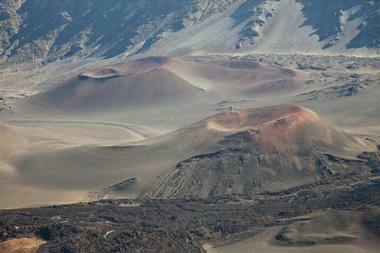 Haleakala National Park is one of the top Hawaii points of interest. Family adventures include a ride on the 1890’s Sugar Cane Train and a visit to the Maui Ocean Center. Hawaii Island (aka the Big Island) is the largest and youngest island in the Hawaiian archipelago and rewards visitors with non-stop opportunities for fun and adventure. Here you can see an active volcano in Hawaii Volcanoes National Park, where you can hike over 150 miles of trails through scalded deserts, craters, and rainforest, walk through a 500-year-old lava tube, and visit the Thomas A. Jaggar Museum to learn about volcanology. There are several heritage and historic sites you can tour, including Kealakekua Bay State Historical Park, where you can scuba, snorkel, or kayak. The dramatic natural beauty of the island has inspired many artists and you can see their work at several galleries as well as at the East Hawaii Cultural Center and the Lyman Mission House Museum in Hilo. Oahu is the third largest of Hawaii’s six main islands and is home to Honolulu, the capital of Hawaii, and marvelous Waikiki, where the sport of surfing originated. There is an endless list of water sports to keep energetic visitors happy and history buffs will find plenty to interest them after a day on the beaches – in downtown Honolulu you can visit the historic Lolani Palace, while at the Pearl Harbor National Historic Landmark you can learn all about the Japanese attack on Pearl Harbor during World War II on a tour of the five historic sites that commemorate this event. The Bishop Museum showcases Oahu culture, while at the Hawaii State Art Museum and the Honolulu Museum of Art – Spalding House you can admire the visual arts. Kauai is traditionally known as the adventure capital of the Hawaiian archipelago and the action starts the moment you step off the plane. In addition to snorkeling, scuba diving, swimming, and sunbathing, you can enjoy fabulous scenic/snorkeling boat trips along the sea cliffs of the Na Pali Coast, where you have a great chance of encountering dolphins, or try your hand at kayaking the beautiful Wailua River. Other adventures unique to Kauai include tubing along the historical water channels of Lihue (which were built to irrigate the sugar plantations), zip-lining high above the Kauai rainforests, and off-road 4X4 adventures. You can also go hiking in the Kokee State Park or Waimea Canyon, play a round of golf, or take an aerial tour of the island with Blue Hawaiian Helicopters. 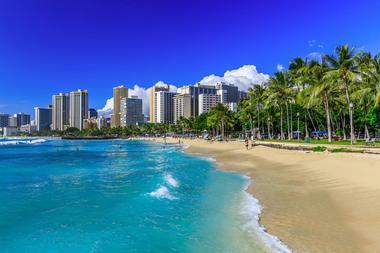 Honolulu is the largest city in Hawaii and is home to a large percentage of the Hawaiian population. The city contains the state capitol, many historical landmarks, a vibrant arts scene, great shopping and nightlife and, of course, famous Waikiki beach, where surfing was invented. 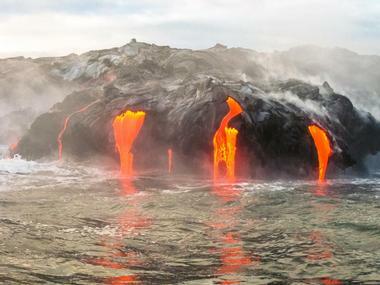 In Hawaii Volcanoes National Park on Hawaii Island you can literally see the Earth taking shape before your eyes as the Kïlauea Volcano, the world’s most active volcano, constantly produces lava flows. You can observe this amazing natural phenomenon first-hand from the observation deck at the Thomas A. Jaggar Museum, where you can learn all about the fascinating science of volcanology. After visiting the Kïlauea Visitors Center, you can take the Crater Rim Drive Tour or drive the Chain of Craters Road to get a great overview of what the park has to offer. Energetic visitors can choose from several easy day hikes (and there are some invigorating backcountry trails for the super-fit). From its humble beginnings as an early farming and fishing community, Hilo became a thriving town serving the sugar industry in the 1800’s. Today, the town provides an interesting and convenient base for visitors wanting to visit the Hawaii Volcanoes National Park, which is just 45 minutes from Hilo. Downtown Hilo is home to many early buildings, several of which are on the National Register of Historic Places - you can visit the neo-classical Palace Theater (1925), several art galleries, and the Hilo Farmers Market. If you can tear yourself away from the beach, you can visit the Pacific Tsunami Museum, the Lyman Mission House and Museum, the Mokupapapa Discovery Center, and the Imiloa Astronomy Center. 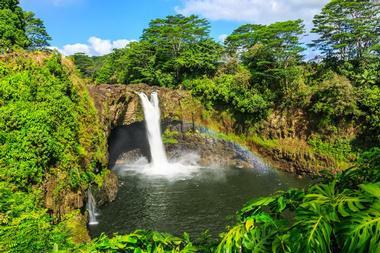 Hikers can have fun admiring waterfalls and the Boiling Pots at the Wailuku River State Park. Molokai is the perfect Hawaiian island for visitors who would like to escape the glitz, glamour, and shopping malls of the larger islands and get back to nature in a Robinson Crusoe-like setting. Here you can spend your days dozing under a palm tree or get as active as you like in the tempting warm waters. There are several outfitters who will rent you anything from a kayak or surf board to scuba gear and fishing tackle – they will also arrange the perfect whale watching expedition or take you deep-sea fishing. 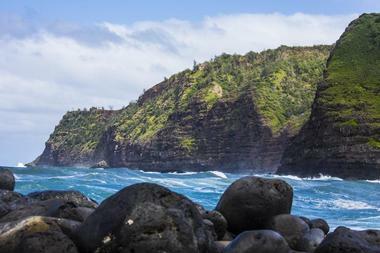 Other activities include visiting a macadamia nut farm and a coffee plantation or taking a mule ride down terrifyingly steep sea cliffs to the Kalaupapa National Historic Park, a former leper colony. The lovely island of Lanai was once the world’s largest producer of pineapples and today you can meet the descendants of the original plantation workers as you tour this friendly island that is famous for its ‘aloha’ atmosphere. The island offers several picture-perfect beaches with great snorkeling and diving sites – the sheltered waters of Hulopoe Bay are ideal for beginners, while experienced divers can head to the Lanai Cathedrals site to dive massive underwater lava tubes. Lanai offers excellent dolphin and whale watching, and when you need a change of pace you can have some fun touring the island by four-wheel drive along hundreds of miles of dirt roads. There are plenty of hiking trails that will lead you to amazing viewpoints, so be sure to bring along your hiking boots. 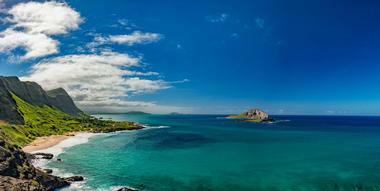 The bustling seaside town of Kailua is situated on the windward eastern coast of Oahu, offering sandy beaches, warm tropical waters, and an almost endless list of activities. You can simply relax under a shady tree on Lanakai beach or take advantage of the calm protected waters of Kailua Bay to learn a new water sport. You can go diving or snorkeling in the calm clear waters or try your hand at kayaking, surfing, wind-surfing, kite surfing, stand-up paddleboarding or sailing. Strong swimmers and kayakers can cross to the beautiful offshore islands in Kailua Bay to explore a bird sanctuary and discover remote hidden coves. You can play golf on one of six courses in the area, shop at some unique little boutiques, and visit the Thursday farmers markets. The little town of Hana is situated along the rugged eastern coastline of Maui, and getting there will definitely be the highlight of your visit. The 52-mile journey from Kahului can take anything from two to four hours as you navigate one of the most scenic drives in the world. The Lana Highway will lead you through rainforests, waterfalls, and dramatic coastal lookouts – you can anticipate 620 dramatic curves and 59 bridges. There are several places to stop and enjoy the views or even have a picnic. 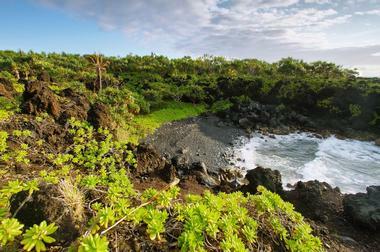 Once you reach Hana, you can simply relax on the beaches, enjoy a variety of water sports, go snorkeling at Wai’anapanapa State Park, or go hiking in the Haleakala National Park. No holiday in Hawaii would be complete without visiting the Waimea Canyon, one of the most outstanding natural gems on the archipelago. The canyon is often referred to as the Grand Canyon of the Pacific and stretches over 14 miles in length and reaches depths of up to 3,600 feet. Most people drive up Waimea Canyon Drive to visit the upper and lower lookout points, which offer sweeping views of rugged crags and deep mountain gorges. Energetic visitors can explore several scenic hiking trails. One great tour option combines a ride to the top of the canyon with an easy mountain bike ride back down to ground level, or you could enjoy an aerial perspective of the canyon and the whole of Kauai on a scenic flight. Haleakala National Park protects a sacred Hawaiian landscape in a remote part of Maui that encompasses a towering extinct volcano (the Summit District) as well as the Kipahulu Coastal District. 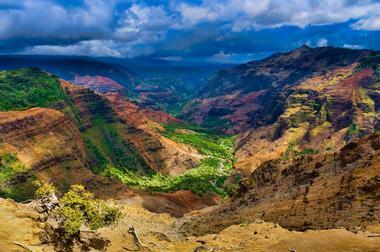 A highlight of any visit to Maui is witnessing the sunrise or sunset from the crater rim 10,000 feet above sea level. You can go hiking along 30 miles of trails in the rugged Summit District (including overnight back-country hiking adventures) and along 3 miles of lush forested trails in the Coastal District. Other activities include ranger-led programs that introduce you to the rare plants and animals of the park (some of which occur nowhere else on Earth), camping, wildlife watching and star gazing. The Napali Coast State Wilderness Park protects a very scenic 16-mile stretch of coastline along the northwestern edge of Kauai, where towering cliffs (up to 4,000 feet above sea level), known as pali in Hawaiian, drop dramatically to meet the Pacific Ocean. 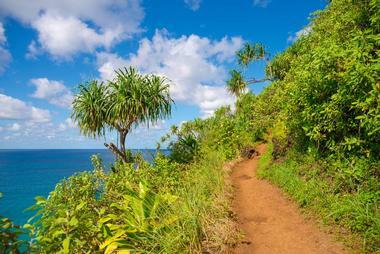 Hiking enthusiasts can take on the strenuous but scenically amazing Kalalau Trail, a 22-mile loop that crosses 11 miles of forests, valleys, and gorges on its way to Kalalau Beach (the first 11 miles take at least a full day and the trail is only recommended for fit and experienced hikers). Less energetic visitors can enjoy a day hike along the first two miles of the trail, which will reward you with some great views. There are basic camp sites at Kalalau Beach and wildlife watching, fishing, and hunting are popular activities in the park. 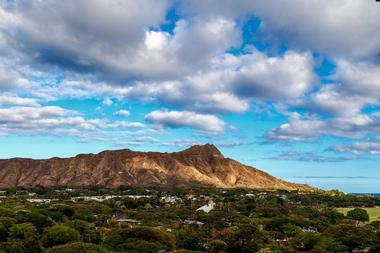 Diamond Head (Le’ahi in Hawaiian) is a volcanic tuft cone that reaches a height of 761 feet above sea level and is one of the most iconic Hawaiian landmarks. The monument towers over the city of Honolulu and is extremely popular with both local and visiting hiking enthusiasts and is one of the most visited attractions on Oahu. You can reach the 300,000-year-old crater rim along a fairly short trail (about one mile long), but due to the steep ascent it is a challenging hike that takes around two hours. However, your efforts will be rewarded with dramatic sweeping views of the city of Honolulu and the Pacific Ocean. Mauna Kea is a dormant volcano situated on the island of Hawaii. 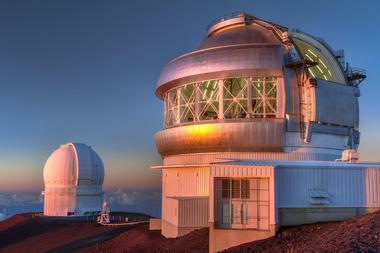 Since the peak of the volcano is the highest point in Hawaii, the summit has become a global center for the study of astronomy and is home to the world’s largest observatory, with 13 telescopes operated by astronomers from eleven different countries. Reaching the summit of Mauna Kea (13,800 feet) is no easy task as you will need a heavy-duty four-wheel drive vehicle to reach the rim, and both hikers and drivers often experience altitude sickness near the summit. However, at the visitor’s information station (at 9,200 feet), you can attend a free nightly star gazing program or a regular Saturday night astronomy or astrophysics program. 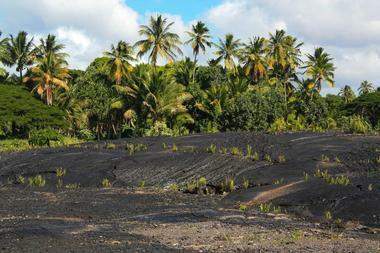 Hiking the unique Kilauea Iki Trail in the Volcanoes National Park on the island of Hawaii is a highlight of any trip to Hawaii. The trail will give you the once-in-a-lifetime opportunity to walk along what was once a sea of molten lava and explore the still-simmering heart of the volcano, which last erupted in 1959. You need to be moderately fit to hike the 4-mile trail, which reaches an elevation of 3,874 feet above sea level. 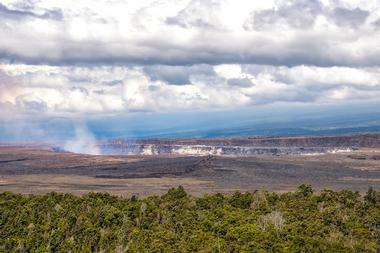 You can set off from the Kilauea Iki Overlook on Crater Rim Drive to explore the trail, which will lead you through lush rainforest along the crater rim and down to the crater floor. There are several interpretive stops along the trail that explain the dramatic sequence of events that occurred during the last eruption. 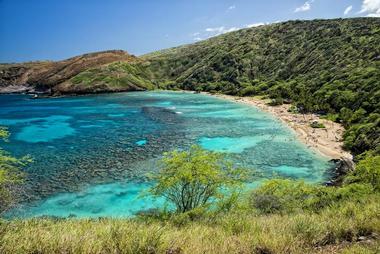 Hanauma Bay is a nature preserve situated within a volcanic cone, offering visitors one of the most unique snorkeling and diving destinations on the Hawaiian archipelago. The bay was declared a protected marine conservation area in 1967 and supports a diverse collection of marine life, including green sea turtles. You can visit the bay by car, bus, or shuttle and spend your day enjoying the pristine underwater wonderland, where you will be surrounded by colorful coral and millions of sea creatures. There are several outfitters where you can hire equipment and take snorkeling lessons. For a great view of the bay, you can hike one of several trails or take a short tram ride to the crater rim. 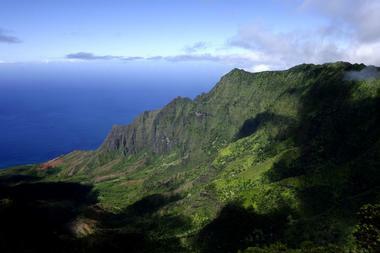 Hikers who are up for a challenge and would like to experience what has been hailed the best coastal hiking trail in the world (by National Geographic) can test their fitness and sense of adventure on the Kalalau Trail in the Napali Coast State Wilderness Park on Kauai. 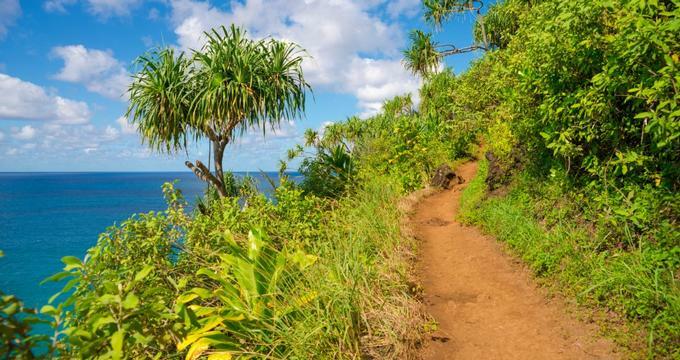 The trail consists of a 22-mile loop through one of the most scenic parts of Hawaii, sandwiched between the towering pali (cliffs) and the majestic Pacific Ocean. On Day 1 of your hike you will make your way through 11 miles of forests, valleys, and gorges on your way to the beautiful crescent-shaped Kalalau Beach, where you will camp overlooking the azure waters of the Pacific, in one of the most remote corners of Hawaii. Wai’anapanapa State Park is situated along a remote stretch of coastline on Maui and protects a wealth of interesting and unusual geological formations, including a black sand beach, sea stacks, blow holes, lava caves, and anchialine pools. You can spend hours exploring the coastline on foot along a paved historic walkway that leads you past stands of native hala forest, a religious temple, and a small cemetery as you make your way to the volcanic black sand beach. Activities in the park include hiking (the Ke Ala Loa O Maui/Piilani Trail is a roughly 2-hour hike), fishing, sightseeing, and swimming. You can also explore lava caves and have a dip in an anchialine pool – a freshwater rockpool with a subterranean connection to the ocean. Situated less than 30 minutes from Honolulu on the windward coast of Oahu, Kailua Beach has a reputation for being one of the best beaches in America. Kailua Beach Park offers visitors a perfect half-mile of soft white sand, warm tropical waters, and just enough of a breeze to cool things down a bit. Here you can simply relax or try your hand at a huge variety of water sports, including bodyboarding, surfing, kayaking, paddleboarding, snorkeling, and diving. There are several outfitters where you can rent equipment and take lessons as well as plenty of places to grab a drink or a meal; picnic tables, showers, and restrooms are also available. Hapuna Beach State Recreation Area is situated on the island of Hawaii and is home to one of Hawaii’s most beautiful beaches, boasting half a mile of soft sand and shimmering azure waters. You can bring along a picnic and make use of the picnic tables and barbecue facilities or get a drink or snack at the on-site snack bar. When the sea is calm, Hapuna Beach is perfect for swimming and snorkeling and when the surf is up, you can try your hand at bodyboarding. Other popular beach activities include volleyball, beach football, sandcastle building, and simply enjoying one of the best beaches in Hawaii. Lanikai Beach has to be one of the most beautiful beaches anywhere in the world; imagine a sandy palm-fringed beach lapped by the azure tropical waters of the Pacific and you will start to get the idea. Lanikai beach is totally unspoiled (and also undeveloped – if you like kiosks, rentals, and restrooms, you might prefer Kailua Beach Park, just one mile away), and provides an almost wave-less protected area perfect for family fun. The calm waters are also great for kayaking and if you are feeling energetic, you can paddle across to the offshore islands to explore seldom-visited secret coves and inlets. 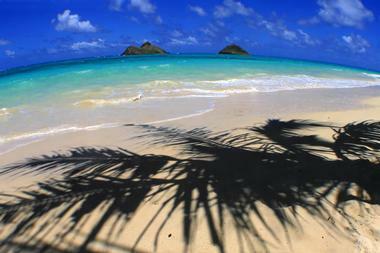 You will find this gem of a beach just 30 minutes from Honolulu on the windward coast of Oahu. 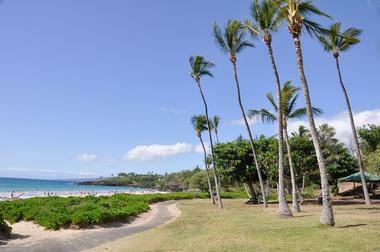 Napili Beach is situated in a picturesque little bay protected by two rocky outcrops on the northwestern coast of Maui. 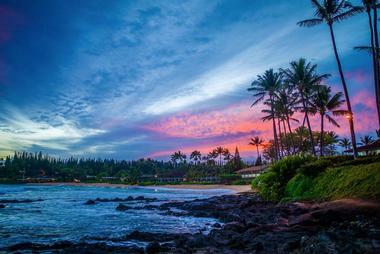 The entire bay is protected by a reef about 30 yards off shore that provides some of the best snorkeling in Maui. The water clarity is excellent and you can easily swim out to the reef and spend hours enjoying the underwater wonderland with the added bonus of possibly swimming with green turtles. In winter, a strong shore-break ensures some wave action to keep surfers and bodyboarders happy, and when these conditions occur, novice swimmers should be particularly careful and perhaps choose to enjoy sunbathing and relaxing on the sandy beach instead. 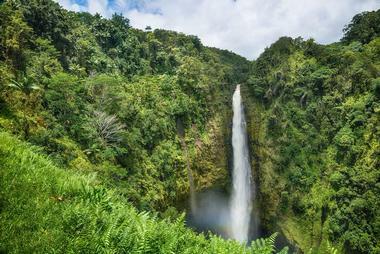 The Akaka Falls State Park on the Big Island of Hawaii is home to lush forest, waterfalls, and a deep gorge, making it a perfect place for nature lovers to explore when you need a break from Hawaii’s wonderful beaches. You can discover the cascading Kahuna Falls and the dramatic Akaka Falls as you make your way through lush tropical vegetation along a paved pathway that leads to several lookout points. The entire Akaka Falls Loop Trail is under a mile long and the fairly steep walk, which features many steps and is unsuitable for wheelchairs or children’s buggies, will reward you with a great view of the 442-foot Akaka Falls as they drop dramatically into the water-eroded gorge far below.